Jack Layton was an inspiration to millions of Canadians. 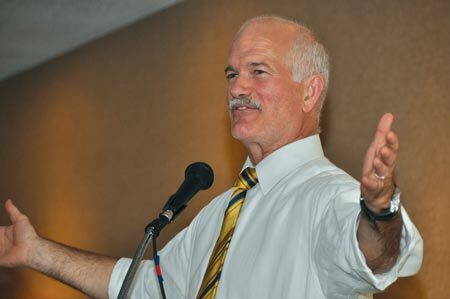 Union members both active and retired lost a great friend and champion with the passing of Jack Layton. Jack had incredible energy. He was always on the go in his tireless work on behalf of people. It is hard to conceive of a world without him. We were honoured to have him speak at the last CURC Convention, where he stressed that the campaign to protect and improve pensions was the new medicare for the NDP. At the same time, he and his caucus pushed to have a national pharmacare program. Jack’s efforts took the federal NDP to heights never before achieved. Tommy Douglas spoke of establishing a New Jerusalem but it was Jack who took the party to the mountain overlooking the New Jerusalem. He, like Martin Luther King, will never get to the promised land but he has given us the opportunity which we all must grasp. Jack fought for causes that many thought were lost but he knew they were only lost if you gave up. He never did and the results showed it.